Losing teeth can cause a significant impact on your appearance creating functionality issues. It can also put you in serious problems that may affect your self-confidence. Teeth replacement has come a long way since the last few decades. Missing tooth raise many common concerns of infection, but a proper teeth replacement option is a key to flaunt a confident smile again. With so many replacement options available, the questions you will need to ask your dentist are a bit different nowadays. What is the difference between dental implants Sydney and dental bridges? Which one will fit me? Although do dental implants are often the ideal choice most of the dentists suggests, here are some other factors you should consider first before deciding the best for you! 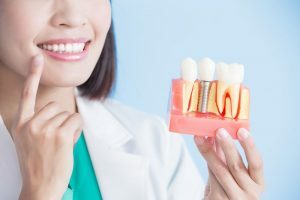 What are Dental Implants Sydney how do they work? The underlying structures of a tooth are quite complicated than you think. It includes ligaments, nerves and bones. When these structures are removed, the surrounding areas will slowly begin to deteriorate with time. Dental implants are typically titanium metal post that will replace these structures. When left undisturbed, overtime the jawbone will grow around the implant metal, and your dentist will check if they are secure enough to hold the crown. A custom-made dental crown that looks like natural teeth will be mounted over the implant once it is all set. Dental bridges are a more traditional way to replace missing teeth. Here the bridge is attached to the remaining healthy teeth surrounding the gap to create a bridge across the area where the gap is. A cap is then placed over each tooth thus replacing the missing once. Both these teeth replacement options are in use nowadays. However, dental implants are the most popular when compared to traditional bridges due to their longevity and flawlessness. Here are certain comparisons for you to get a better view! Dental bridges were the only choice in the past to replace missing teeth. Here the adjacent teeth need to be prepared by removing some of the enamel to fabricate the bridge. However, with dental implants, the dentist replaces the individual tooth and will not alter any neighbouring structures. Moreover, if you have lost a tooth for a long time, the gum and the bone structures will start receding. If yours is this case, then only dental implants can help you restore the bone function with a grafting. It is more evident that dental implants are durable compared to bridges. They protect the underlying structures for a lifetime. The titanium metal will fuse with the jawbone naturally through the process called osseointegration. Titanium is a solid metal that is resistant to gum problems and decay. Considering bridges, as a small part of the tooth remains below even the normal wear and tear may cause the bridge to fall easily off your mouth embracing you. Not just durability, the cheap dental implants Sydney also offer a more aesthetic solution. They will provide the most pleasing results because your dentist can make the final teeth look just like your natural enamel. Go ahead get your dental implants Sydney now and flaunt beautiful smiles every day!